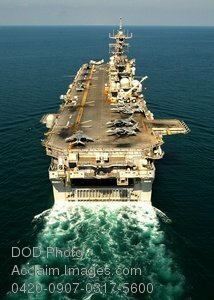 Description: Free, public domain image: USS Iwo Jima Aircraft Carrier in the Persian Gulf. PERSIAN GULF (Nov. 21, 2008) The multi-purpose amphibious assault ship USS Iwo Jima (LHD 7) transits the Persian Gulf. Iwo Jima is deployed as part of the Iwo Jima Expeditionary Strike Group supporting maritime security operations in the U.S. 5th Fleet area of responsibility. (U.S. Navy photo by Mass Communication Specialist Seaman Chad R. Erdmann.